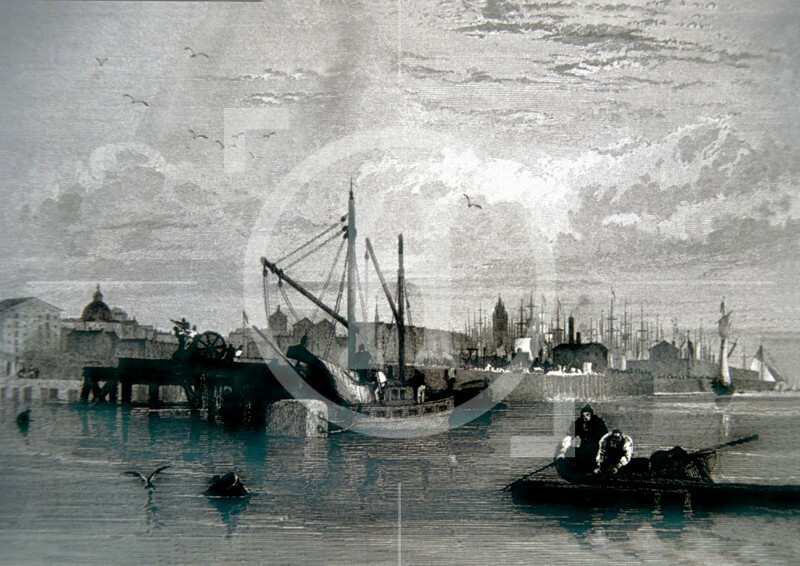 A view of part of the waterfront in the early 1830s. It shows the construction of the docks adjacent to the Princes Dock, the entrance to which is marked by the flagstaff on the dock wall on the right of the picture. Granite blocks for the dock walls were conveyed on a sort of wooden railway; the timber framework marked the line of the dock wall. A cast iron diving bell can be seen suspended from the stern of the barge in the centre of the picture. In the background, from left to right, can be seen the domes of St Paul's Church and the Town Hall and the lantern tower of St Nicholas's Church.